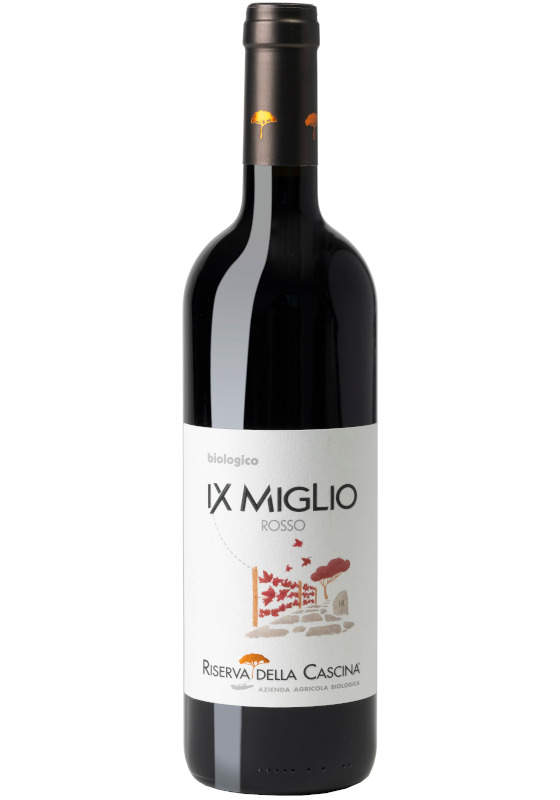 The grapes varieties composing this wine are Merlot, Cabernet Sauvignon, Sangiovese; they are grown in the sunniest lots of our vineyard at the IX mile of the ancient Appian Way, so that they reach a complete maturation. It is a very nice wine which can be drunk shortly after bottling and it is very pleasant with its marked character: particularly fruity, it has fresh and lively perfume, joined by spicy notes coming from the blending. Another typical feature is saltiness, due to the mineral soil of Riserva della Cascina. Grapes: Merlot, Cabernet Sauvignon, Sangiovese. Wine-making: 10-12 days fermentation with grape skins, temperature aorund 18° C.
Bouquet: fine and intense, with notes of red and black berry fruit, balsamic nuances and inklings of tobacco, liquorice and iron-like minerality. Taste: dry, warm, soft, quite fresh and tasty, full. Food matching: perfect with red meat, seasoned cheese and salami, ham, cold cuts, vegetable soups. Serving temperature is 14-16°C.